Posted By:Unknown | At:4:54 PM Be the first to comment! (Tennessean) -- Tensions at Tennessee State University reignited Monday as a vocal faculty member opposing university leadership was taken away in handcuffs from a meeting. After campus police arrested the chair of the Faculty Senate, Jane Davis, on a charge of disorderly conduct, the Senate voted to remove her from her leadership position — a vote she claims is illegitimate. 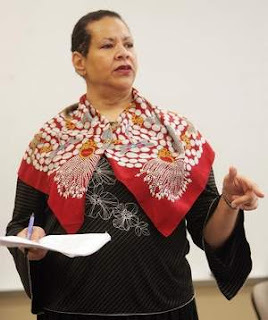 Davis, an English professor, has been an outspoken critic of several policies and decisions made by TSU interim President Portia Shields, who has clashed with some faculty since her arrival in early 2011. In July, Davis publicized allegations that school administrators improperly changed 270 student grades last fall. The university said it was correcting a mistake, but Davis and other critics said the school was passing students who hadn’t completed their classes. Under a new state funding formula, student success is a factor in the amount of money a university receives. Last week, sociology professor Oscar Miller officially suggested ousting Davis and the Faculty Senate’s executive council from office, and the university surveyed faculty members on the idea. When the online poll closed, 60 percent wanted Davis removed, and 59 percent wanted the board’s executive council to go with her.